This device connects to your wireless network and uses Network Time Protocol to set the time. The innovative setup process is straight forward. It mimics the GPS module by sending data to the clock in the same format, the setup is the same for both. The result being a time accurate clock that can be placed anywhere where there is a WiFi signal and as such it is not dependant on the availability of a GPS or Radio time source. This means that the clock can be placed anywhere in a building without the need to be near a window etc. There is a reset button that can be used to return the unit to Access Point mode for the checking of settings or the complete resetting of the unit to factory defaults. Placing 2 x QTC clocks side by side, one with the NTP module and one with the GPS module resulted in a time difference between the two of less than 0.5 seconds. 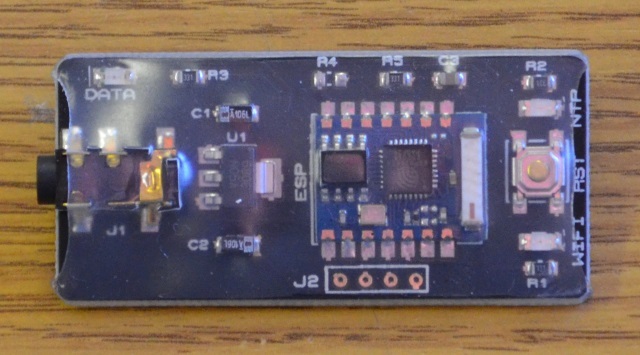 The module has three surface mount LED's that provide details of its Wifi and NTP connection status as well as data transmission activity. If you have WiFi and want to set your clock via an accurate time source this is the way to go.